Peacefully with family by her side on Sunday April 7th, 2019, Marg in her 78th year. Beloved wife of Raymond. Loving mother of Diane Goddard (George deceased), Maggie Peddle, Charmaine White (Kevin) and Darlene Peddle. Predeceased by daughter Tina Robertson and parents Leander and Anastasia (née Dalton) Picco. Adored Nanny of Lisa and Shawn Robertson (Jennifer), Laura (Timothy), Andrew, Matthew and Maddison White and Andrew and Holly Pearson. Grandnan to Evan, Dylan and Ayden Young and Hannah Robertson. 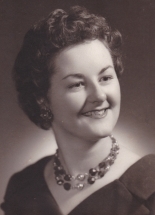 Sister of Marion Clarke (Fred; deceased), Catherine Bickford, Clarence “Buck” Picco (Cavell), Daphne Sheppard (Baxter; deceased), John Picco (Helen), Edna Schwaighofer (Manfred), Eliza Picco, Robert Picco (Kathy) and predeceased by Kenneth Picco and Shirley Dorman (Jim; deceased). Will be greatly missed by many nieces and nephews. Relatives and friends are invited to attend at the McINTOSH-ANDERSON-KELLAM FUNERAL HOME LTD., 152 King Street East, Oshawa (905-433-5558) on Saturday April 13th, 2019 from 10:00 am until time of Memorial Service at 11:00 am. Donations in memory of Marg to a charity of choice would be appreciated. Sending all my love & my condolences to my family at this hard time 💓 may aunt Marg rest in peace. My sincere condolences to you, Diane and your family. Hugs. Our deepest condolences. Aunty was such an amazing lady. she had a smile that would light up a room and a hug that made all your worries feel better. you'll be greatly missed. My Deepest Sympathies to all of Marg's Family , May she RIP and soar High . Our sincere condolences to Ray and his entire family. Margaret, you will be greatly missed, RIP. My sincere condolences to the Peddle Family and Lisa Roberson and her family. She was a wonderful lady and I know Lisa looked up to her so much. Fly high with the angels!! !